This past week, Congress voted to remove online privacy protection laws that restrict Internet Service Providers from selling information about your browsing habits and history to third party companies. In addition, the FCC will now be restricted from passing new information privacy laws that perform the same function with respect to Internet Service Providers and your personal browsing history. Your Internet Service Provider (ISP) sees everything you do online. Every medical search, every purchase, every search you perform about some personal issue you need to resolve are all available to your ISP. In addition, you have a fiduciary relationship with your Internet Service Provider. They have your name, address, and credit card number. If ISPs share and sell your personal browsing information with third parties or choose to use it themselves for financial gain, you basically have no online privacy. Ars Technica has more about why the government’s action is not in your best interests, and there are famous incidents showing what happens when aggressive targeted marketing goes too far. While it’s true that companies like Google and Facebook already track their users aggressively, the difference is that you can take measures to reduce what Google and Facebook see of your online activity. You simply can’t avoid your ISP. In addition, most people have multiple ISPs now, between their home internet service and their mobile phone service. Each of these providers will have their own privacy policies and decisions on what user data is fair game for selling to third parties. Although Comcast and others have since publicly claimed that they will not sell your browsing history, the fact is that they aren’t required to be transparent about this anymore. They can change their minds at any time (or just lie to you) and you’ll never know, because they aren’t required to inform your or ask you to opt in to sell your information or use it themselves to target ads at you. The good news is you don’t have to give up without a fight. Virtual Private Network services can help keep your browsing habits and history from becoming a product sold by your ISP. Such services are now common, reliable, relatively inexpensive, and are available on all platforms. Whether you just feel like resisting on principle or you are genuinely concerned about maintaining a high level of online privacy, a Virtual Private Network service can be a great solution. A Virtual Private Network (VPN) allows you to create an encrypted “tunnel” within your internet connection. This means that your ISP won’t be able to decipher the data passing through their servers to and from your house – your traffic will just appear as random encrypted data to them. There are a wide range of commercial VPN service providers that are affordable and will adequately provide protection from overly-curious Internet Service Providers and other creepy companies and individuals. One important caveat about VPNs: if your goal is to go beyond protecting your privacy from your ISP and other casual observers and to become truly anonymous online instead, VPNs aren’t a perfect solution. To be anonymous or to hide all information about what you’re doing on the Internet from everyone, you need to understand something about how VPNs and the Internet work. That level of online anonymity will require more work, more understanding, and a strong multi-layer approach. However, if your desire is simply to keep yourself safe from service providers looking to make a buck off your browsing or from people trying to spy on you over your network, VPNs are perfect. You just need to do a bit of research to find the best VPN for you. For example, it’s important to choose a VPN provider which changes your Domain Name Server (DNS) settings to something other than your ISP’s DNS addresses, or the ISP will still be able to collect much information about your online activity. Domain Name Servers act as the address book of the internet. DNS takes an address, such as http://www.mymac.com, and associates it with its IP address, such as 69.163.185.42, which your browser can then connect to. An ISP who can see your DNS traffic may not be able to see what you’re doing on specific sites, but they will know what sites you visited, and this alone is valuable information that an ISP can sell or use to target ads to you themselves. The best VPN services utilize their own DNS servers. VPN services are not just useful at home. They are basically mandatory on the go as well. Public Wi-Fi hotspots at coffee shops and hotel Wi-Fi can be convenient, but they’re terrible when it comes to security and privacy. It’s very easy to acquire tools that can sniff the traffic on a Wi-Fi network. Far from being just about personal data privacy, VPN use on public or shared networks is truly about being secure. Using a VPN whenever you’re on a shared Wi-Fi access point can mean the difference between having your information stolen by malicious third-parties or not. Cellular connections are typically not as insecure as public Wi-Fi, but your phone can be tricked into connecting to a device that mimics a cellular antenna tower, but that allows a third-party to intercept all your traffic. A VPN service will help provide security in such situations. It’s true that this is currently a fairly unlikely scenario, but when you are connected to your cellular provider, they are functioning as an Internet Service Provider. As such, they may be motived to use your data against you for profit as well. Companies like AT&T and Verizon have been the most eager to violate consumer privacies in the past. If you’re already paying for a VPN service, there is no real reason not to use it for your cellular data connections. Ok, so you know you need a VPN, but how do you choose one? There are a lot of them out there, and if you search online for reviews, make sure you stick to well known tech sites for reviews. A lot of VPN providers have created neutral sounding websites to review their products. Also understand what your goals are before you pick a VPN service. If you just want privacy from your ISP and from people spying on shared Wi-Fi networks, you have a lot of options. If you also want increased protection from government surveillance, the problem becomes more difficult. In that case, you need a VPN outside of the US or any of the other Five Eyes countries. Even then, just a VPN alone probably won’t be enough, and shielding yourself from government scrutiny is a much longer and more complicated topic. Assuming you just want to keep ISPs from profiting from you and hackers from owning you on public networks, two extremely popular VPN services at the moment are TunnelBear and Cloak, and both are good options. TunnelBear is relatively inexpensive and offers support for iOS, Mac, Windows, and Android. They’ve been reviewed in VentureBeat, The Next Web, and LifeHacker, among others. They allow unlimited devices, but only 5 of them may be connected to TunnelBear at once. They have friendly looking, easy to use apps that can be used by kids without confusing or frustrating them. Cloak is more expensive, but based on several reviews, appears to be one of the faster VPN services. It also allows unlimited devices, and no restrictions on how many of them can connect using Cloak at one time. Cloak has apps for Mac, iOS, and Android (the Android app is still in beta). They have been reviewed by Macworld, the Mac Observer, The Next Web, LifeHacker, and GeekWire. 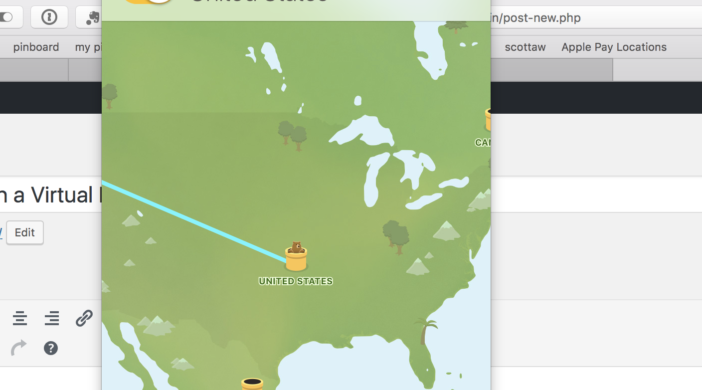 It’s important to note that both TunnelBear is in Canada, and Cloak is in the U.S. This means they fall into the category of VPNs in Five Eyes territories. If you’re looking for privacy protection from the government, TunnelBear and Cloak aren’t for you. Another popular option is PIA, or Private Internet Access. They are also based in the US, so they’re subject to the same qualifiers I talked about with TunnelBear and Cloak, but they’re inexpensive and support Mac, Windows, Linux, iOS, Android, and also have a Chrome browser extension. Finally, if you want to up your game a bit and try to keep the government from knowing what you’re doing at all times, There’s NordVPN. They’re located in Panama, they don’t store any activity logs, they run their own DNS servers, and they offer support for Windows, Mac, iOS, and Android. Unfortunately, in my testing, they were a bit slower than either TunnelBear or Cloak. For mobile use, this wouldn’t present an issue, but if you have fast home internet you may not get the full bandwidth your ISP can deliver. For example, I consistently get close to 250Mbps downstream from Comcast, but with NordVPN enabled my speed testing results were reduced to between 50-80Mbps. If you’re interested in poring over some fairly detailed VPN service comparisons, The One Privacy Site has you covered with both simple and detailed comparison charts, as well as a simple color badge comparison chart. When it comes to VPNs, do your homework, ask others, and don’t be fooled by fraudulent providers. Opportunists are popping up to scam people out of money, capitalizing on the current popularity of and interest in VPN services. If you ever decide you’re really serious about VPN use, you can even get a home router that supports outgoing VPN and ensure that everything you do online at home goes through your VPN service with zero configuration of your computers, tablets, and phones required. I’m not going to cover that here, but Greycoder’s article on the best VPN routers of 2017 is a great place to start. Having your router connect to your VPN instead of each device on your network connecting also solves the problem of limits on how many devices you can have connected to your VPN service at once. The limit varies by VPN service provider. VPN services are a good idea anytime. You should always use one whenever you’re on someone else’s network, and they’re a good idea for use at home as well. As companies continue to look for ways to monetize your personal information, think about your rights and know your options for protecting your online privacy.